On Thursday evening on March 26, 1997, 39 bodies were discovered at the Heaven’s Gate compound in Rancho Santa Fe, CA by a former cult member and the sheriff’s department. The group was found carefully organized for their death and afterlife. They died in three stages so some bodies were up to 36 hours old by news reports from the coroner. They were dressed identically in unisex hair and clothes so authorities thought they had discovered 39 male bodies at first. Eighteen of the men had been castrated. They had their bags packed with IDs in their breast pockets and money in their pants pockets. According to the group’s beliefs they were going to cast off their bodies to join a spacecraft of aliens that were hiding in the Hale-Bopp comet’s tail. They thought they were going to the next step of evolution since they believed that the end of the millennium was going to be the destruction of the world as we know it. Some members had been preparing for this time up to 20 years. Marshall Applewhite was the founder called Bo along with his partner, Bonnie Nettles known as Peep. They were also called THE TWO. They believed in UFOs, astrology, reincarnation and the end of the world. The cult members were Trekkies, web page designers and extreme believers that severed all ties from the world. Discipline was the rule at Heaven’s Gate. What does astrology tells us about this group’s leader and the timing of their departure from this earth? 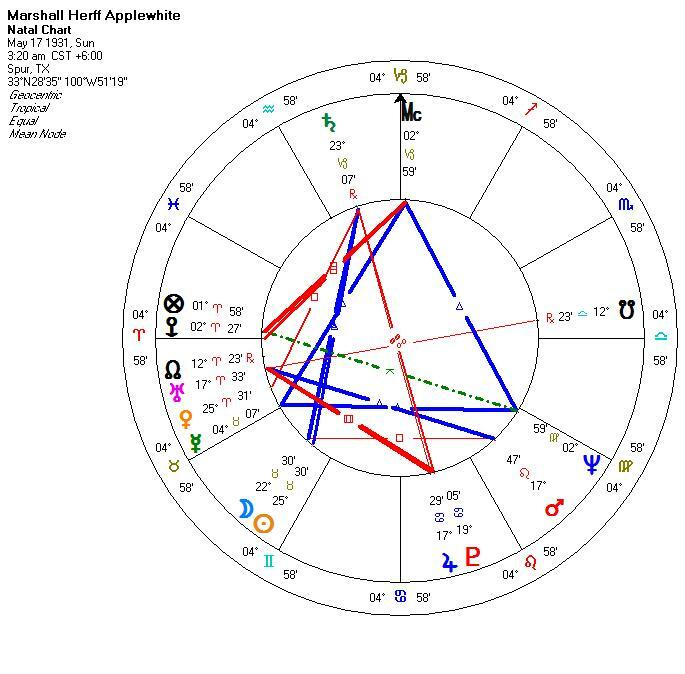 I look to Marshall Applewhite’s birth chart and the transits at the time of the suicide since he controlled the group and was the leader/patriarch. From the nature of this group, he has the dominance, vision and charisma for the rest to follow him in his beliefs and dreams. Marshall Herff Applewhite was born May 17, 1931 at 3:20 am in Spur, TX. He was born with the Sun and Moon conjunct in Taurus and with Aries rising. Aries dominates his chart with the Ascendant, Part of Fortune, lunar node, Uranus and Venus all in Aries. Aries is the sign of military leadership, strong will, dominance of others (especially with Venus in Aries too) and a need to be Numbero Uno in any group or organization. This quality Marshall had in spades. In addition, his Jupiter was conjunct Pluto in Cancer and square his natal Uranus in Aries. This is a marriage of his beliefs in religion, philosophy, death, Armageddon and radical futuristic ideas fused into a structure of autonomy and independence with survival needs. He would have made an excellent military leader and he treated the cult life like the army. Everything was regimented down to minimal speaking and changing activity every 12 minutes. Meals were twice a day without choice. Marshall was a control freak that dictated the members’ lives completely. Unbelievably, his birthday is very close to the Jones Town massacre leader, Jim Jones who was born May 13, 1931. He was noted for being a good singer and was choir director in a Houston church before he was radicalized. Note that he has Mercury trine Neptune which would tie in music with work and service. Taureans are noted as a strong sign for singers and he has Mercury, Moon and Sun in Taurus. 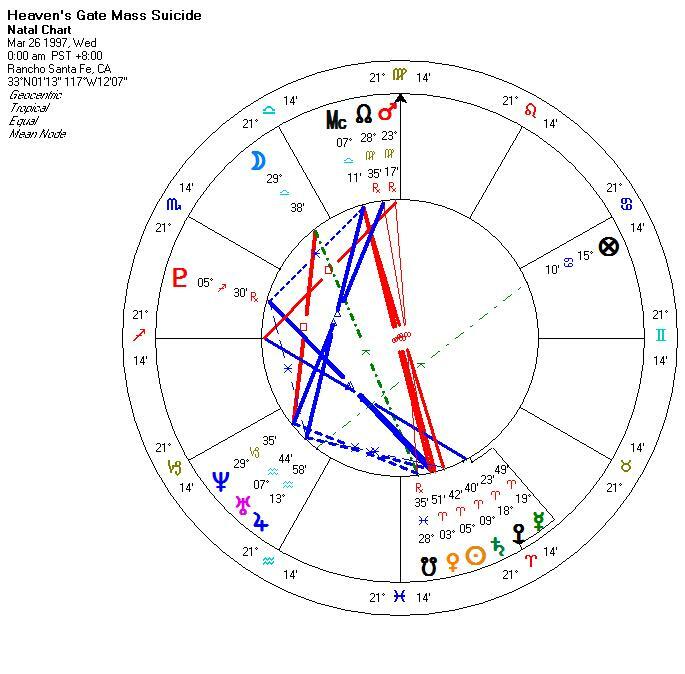 The man was organized and methodical with Saturn trine his Moon-Sun conjunction but note that this conjunction was also squared by his Mars in Leo. I believe him to be highly sexual and possibility frustrated by women. He could have had a difficult relationship with his mother. His solution was to be castrated along with 17 other male followers. Why did he choose this week of all times? The transits to his chart are the major answer. For the first two months in 1997 transiting Mars was stationary on his Descendant-Ascendant line and Saturn was there too. This can create tremendous personal pressures of duty, responsibility, stress, depression and radical change. The lunar eclipse fell across these points on March 23rd, the full Moon was on the 24th and Venus joined the grouping at 2 degree Aries on the 25th. It was some time on the 25th that the mass suicide began with the transiting Moon in opposition to Mercury on Marshall’s natal Uranus. This combination of events signals human instability with drastic change at this time. Eclipses have long been noted for major news events. Note that the Oklahoma City bombing occurred near one and the Gulf War began near one. Transiting Jupiter at 13 Aquarius was applying to an opposition of his Mars which tied in his religious beliefs of radical impulsiveness to take his cult family with him. Note that transiting Jupiter was near the heliocentric nodes of Neptune at 11 degrees Aquarius which brought in fantasy and merger with the One into the picture. For over a year transiting Pluto was squaring his Neptune. This can be a merger of his fantasies, dreams and need for oneness to be connected to death and suicide. This transit fell on his 9th cusp which rules religion, philosophy and long distance travel. The recent talk on the Web about the Hale-Bopp comet with a spaceship in the tail was just the emotional trigger needed during the eclipse to set him into action. Eclipses have been recognized as significant all the way back to Chinese astrology in 1500 BC. The Chinese have the longest continuous records existent back to 200 BC with partial records as far back as 1500 BC. Comets and eclipses were highly respected and feared in the ancient world. Modern astrology still looks to eclipses as significant news making events. Carl Payne Tobey, one of America’s best astrologers of this century studied them and found that it was the relationship of the Sun to the lunar nodes in hard aspect ( 0, 90 and 180 degrees) that produced more death by fire and wars that began and ended. Eclipses occur only with the 0 and 180 degree aspects but he found the 90 degree aspects of the Sun to the lunar nodes to function also. If these Moon Wobbles (Carl’s term) occur with additional planets aligned to them, then more intense events are likely. The Oklahoma City bombing occurred on April 19, 1995. A lunar eclipse occurred on April 15th, the Sun exactly squared Uranus in Aquarius on the 20th and the Moon Wobble was exact on April 26th. Uranus in Aquarius in alignment to the Moon Wobble and the full moon was the trigger that added surprise and explosive behavior to this major news event. This event so shocked the nation that it dominated the news for a solid week. Was the comet a factor? Modern astrology simply doesn’t have enough frequent events recorded to say with any certainty. It’s a fascinating issue to be examined further. I think that transiting Mars in alignment with this eclipse and Moon Wobble is the additive factor that intensified this occurrence. Birthdata confirmed by birth certificate in hand. This article has all rights reserved for full copyright protected.